Suitable for screen printing on large size architectural flat glass. Manual edge alignment, suitable for small­volume large-variety printing. Adjustable three vacuum zones to focus efficiently suction power. Unique roller design, the glass is unscratched while traveling. Attached peel-off function, to prevent mesh from sticking to substrates during printing. 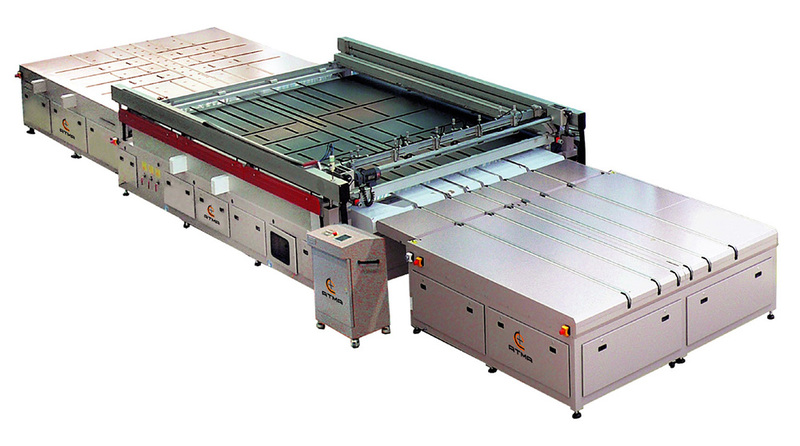 Maximum printing area 1500mm x 3000mm 59" x 118"
Minimum printing area 1000mm x 1500mm 39" x 59"
Max O/D frame size (DxW) 2100mm x 3800mm 82" x 150"
Screen frame height 26mm to 54mm 1.02" to 2.12"
Glass thickness 5mm to 25mm 0.197" - 0.98"